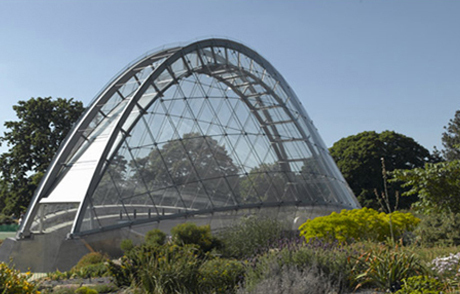 The Alpine House is a small exhibition greenhouse at the Royal Botanical Gardens and proved to be a challenging project. The brief called for the environment within the space to mirror that found in the Alps, to allow the exhibition of flora and fauna from that region. To analyse how this might be achieved using passive techniques, extensive building simulation models were developed. This resulted in the choice of a thermal labyrinth beneath the space to cool incoming air, with the purging of the stored heat carried out at night. Although this reduces the incoming air temperatures sufficiently, the plants also require large amounts of sunlight. To meet this requirement without overheating, a special low iron glass was specified to maximise light transmission while also providing attenuation of solar heat gain.